I will be appearing at the Museum of Jewish Heritage in lower Manhattan on Wednesday, January 14, at 7 PM. 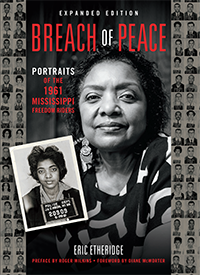 I will show photographs from the book and Freedom Riders Joan Pleune, Lewis Zuchman and Hezekiah Watkins (above) will talk about their experiences. At the time of the Rides, Joan was a student at Berkeley, Lewis a student at the University of Bridgeport, in Bridgeport, CT, and Hezekiah a student at Rowan Junior High in Jackson, MS. And there will be singing: the event will include a gospel performance by Neshama Carlebach and the Green Pastures Baptist Choir. Last summer, Hezekiah was in town for another Breach event with Joan Pleune, and we got together at the publisher’s office to make short video about their experiences on the Freedom Rides.